There's an old saying, "Don't count your chickens before they're hatched." This thought was first recorded in print by Thomas Howell in New Sonnets and Pretty Pamphlets, in 1570. This simple statement is infused with wisdom. 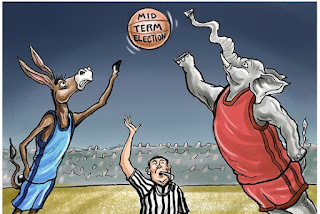 I'm calling Democrats out today, who think it's going to be a slam dunk when it comes to retaking The House in November. That it's a done deal. Here's a friendly reminder...no one thought Trump would win. If the Democratic party didn't learn it's lesson that time, then they're in trouble. Yeah, it looks good according to all the political pundits who are predicting a Blue Avalanche in the mid-term elections. The fact that a lot of long-time Republicans are leaving Congress makes it easier for the Democrats who don't have to run against those incumbents. All of these good signs mean nothing on election day when the voters turn out. Upsets happen. Polls are forever suspect after the 2016 election. If the Democrats get out a strong ground game, and it's looking that way based on some earlier primaries, they should be able to retake The House. Hopefully, overconfidence won't be the Democrats Waterloo again.